Retinopathy of prematurity (ROP) is an eye disease that occurs in a small percentage of premature babies. In ROP, abnormal blood vessels grow on the retina — the light-sensitive layer of cells on the back of the eye that allow us to see. Doctors do not know for certain what causes ROP. Blood vessels in the eye normally finish developing in the last few weeks before birth. Premature infants, however, leave the protective uterus before bloodvessels of the eye have had a chance to fully develop. The infants are then exposed to elements, such as medication, high levels of oxygen, and light and temperature changes. These factors may interfere with the normal development of blood vessels in the eye and cause ROP. Premature babies should be screened for ROP and all other at-risk illnesses shortly following birth. An ophthalmologist (Eye M.D.) can diagnose ROP during an examination of the baby’s eyes in a hospital’s neonatal intensive care unit (NICU) or nursery. ROP may not be apparent, however, until several weeks after birth. Therefore, premature babies at risk for ROP should also have their eyes examined by an ophthalmologist four to six weeks following birth. 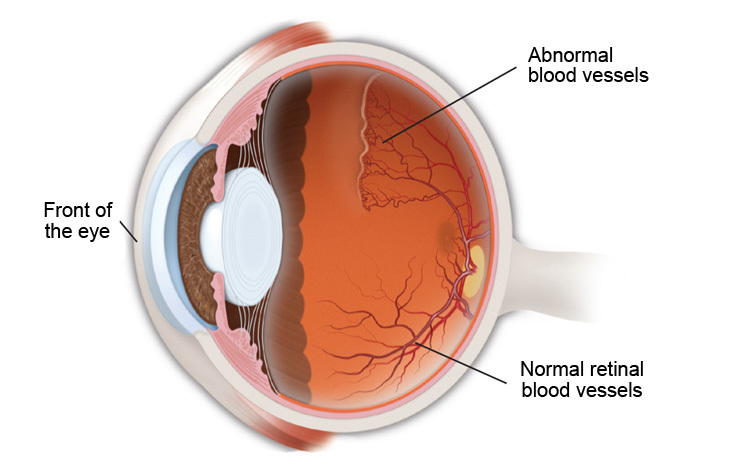 If ROP is diagnosed, the examinations should continue regularly until the abnormal blood vessel growth goes away on its own or is adequately treated by the ophthalmologist. Early stages of ROP do not require any treatment. If ROP advances, laser treatment is used to eliminate the abnormal blood vessels. All premature babies and babies with ROP need to be followed closely for vision problems.